He wants all that detail so he can see where he left shots on the course (which is usually on the putting green). 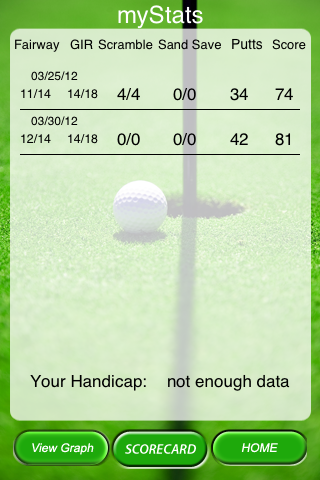 So I spent a couple of hours over the course of a couple of days on the app store looking at all the golf score apps. There are a lot of them, and many of them are very similar. In the beginning it was a little overwhelming. I took screen shots, and studied and compared the differences. One bubbled to the top, called myGolfStats, you can see their website. I wish these apps would be more consistent in their naming conventions, on their website they call it myStrokeTracker, but don’t let that imperfection stop you from considering it. Because from what I can tell, in today’s world, it’s the best one out there for keeping the details. Here is a screen grab where he has recored some of his scores. You can see that it has all the details he is looking for. Plus you can use it to communicate with the USGA for your handicap if you like. You can also preview it on the iTunes store. It is a tool for us to keep track of where shots were successful, and where they didn’t go as planned. Yes, we could do it on paper, and we have in the past. Funny thing is, after the round, we take a picture of the scorecard with our phone so that we don’t lose it! PurgatoryGC, and the Merchent’s have no relationship with this app developer other than being a paying client. The app cost $2.99 in today’s world, by the way. If you do use this app, or anything like it to record your golf scores, make sure you back up your phone. Then back up your computer, then rotate those backups. You will be so glad you did if anything ever happens to your phone, and all your wonderful golf data. Then all you do is restore your backup, and everything is wonderful again!